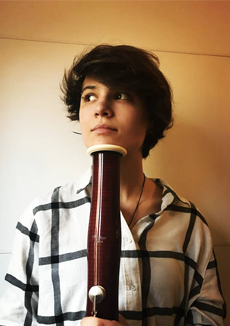 Sarah Carbonare, born into a musical family in Paris, achieved early honors in Rome as principal bassoon in the Juni Orchestra Santa Cecilia Academy, 2014–17. Recipient of many awards, she won first prize at the Città di Tarquinia, Anemos, and Valerio Marchitelli competitions, among others. She collaborates with the Musica in Crescendo Orchestra, Benevento Philarmonic Orchestra, Roma Tre Orchestra, and Teatro dell’Opera di Roma Young Orchestra. She is involved in several chamber music projects and studies with Francesco Bossone in the master’s degree program at the Santa Cecilia Academy.